Our standard range of 10, 20, and 30 litre carry bags are ideal for vaccination programs lasting up to 8 hours. Our bags lose 0.74°C per hour without the use of coolants giving you 8.1 hours if the samples were put in at 2°C and the lid unopened! 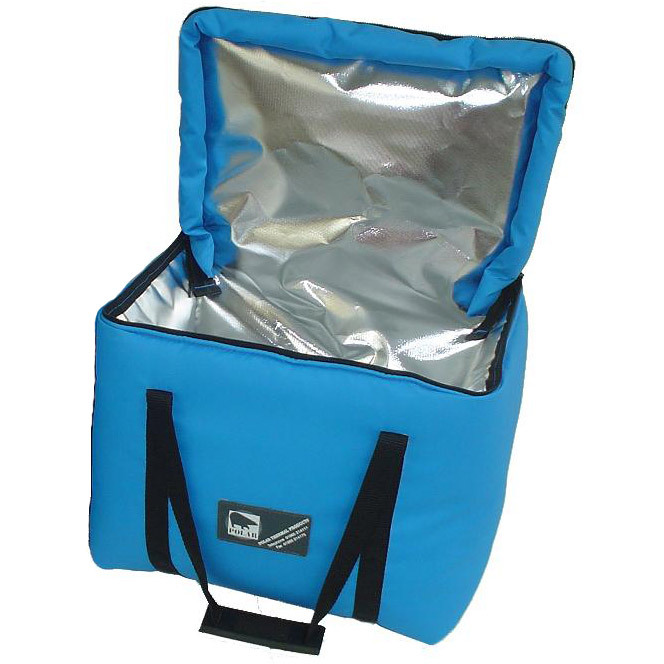 We do however advise the use of 5°C cool packs to help maintain temperature. WE advise a minimum of a cool pack on the top and bottom of the samples but ideally one on each side also. If you are opening and closing the lid on the bag repeatedly, use a layering system in the bag by incorporating our thermal separators in between each layer of vaccines. This reduces the impact of the ambient air getting in to the bag on opening. Also the lid should be opened the bare minimum to extract the vaccines and for the least amount of time! The 3 Inch and 2 inch thermal vaccine carriers have been designed to maintain a temperature of between a 2° to 8°C for up to 8 hours, especially for use with vaccination programmes or specimen collection. The inner lid reduces thermal leakage helping to maintain temperature parameters despite repeated opening of the bag. Developed using NASA technology Polartherm™ is made up of an inner reflective layer, a hollow fibre filler and a waterproof woven PVC outer, the result of which is a material that is both tough and lightweight with excellent thermal control properties. Why not just use a domestic refrigerator? Domestic products are carefully designed to store food items and at the same time conform to the many and various regulations that pertain to that function. Pharmacy & Laboratory requirements are not necessarily exactly the same as those of a household kitchen and the value of the medicines being stored, if only in people's time, its normally much higher; often greatly exceeding the cost of the fridge in which they are stored. Why take the risk by putting them in something built for a different purpose? Vaccines must be stored within a pharmacy refrigerator at a consitent temperature between 2°C and 8°C.